Because of age, obesity or smoking, patients may have a condition called Hiatal Hernia. This situation is very common in patients over 50 years old. Hiatal Hernias is also very typical for patients undergoing bariatric surgery. One study found that 42% of patients who intend to undergo gastric sleeve surgery have either Hiatal Hernia or Para-Esophageal Hernia. If patients are found to have Hiatal hernias, bariatric surgeons need to perform Hiatal Hernia Repair, before they can successfully perform bariatric surgery. Patients are urged to contact our staff if they have GERD or see how our surgeons repair Hiatal hernias. Hiatal Hernia is a condition where the patient’s stomach is partitioned, unnaturally, by the diaphragm. Creating a section of the stomach above the diaphragm and a section below the diaphragm. This pushes up the Lower Esophageal Sphincter (LES) and away from the hiatus, losing its support to keep acid and stomach contents from backing up into the esophagus (reflux). About Hiatal Hernia – What Does it Mean? Sliding hiatal hernia is the most common type of Hiatal hernia – 95% of all cases. It occurs when the gastro-esophageal junction (the junction of the esophagus and stomach), and part of the stomach slide into the chest through the hiatus. Para-Esophageal Hernia (PEH) or Fixed Hiatal Hernia is the least common type of Hiatal hernia. It occurs when the gastro-esophageal junction stays at its spot (at the level of the diaphragm), but part of the stomach slides into the chest through the hiatus. This type of Hiatal hernia is more serious and there is a risk of blood flow blockage to the stomach. Because of the location of the stomach, patients undergoing any bariatric surgery will need to put the stomach back in its original position. It is necessary to complete this task laparoscopically, just like other bariatric surgeries, allowing our bariatric surgeons not to create additional incisions. After the stomach is below the hiatus (opening of the diaphragm), the doctor can continue with the bariatric surgery. Because of the unknown nature of a hiatal hernia, it may return after surgery has taken place. A hiatal hernia needs to be removed during bariatric surgery. If a hiatal hernia is not fixed, the “smaller stomach” can be pulled further up through the muscle wall. This can cause a major complication, as the stomach can become strangulated. Pressure, constant and powerful, from surrounding muscles, can occur through coughing, straining during a bowel movement, lifting heavy objects, or vomiting. If a hiatal hernia is not repaired during Laparoscopic Vertical Sleeve Gastrectomy (VSG) surgery, the higher pressure in the new stomach causes vomit and/or severe acid reflux. Mexico Bariatric Center (MBC) surgeons repair a Hiatal Hernia during gastric sleeve if present. After the stomach is released by longitudinal resection along the greater curvature and fully separated from the spleen & bowels, the surgeon checks for the presence of a hiatal hernia and repairs it if it is needed. When patients have acid reflux for an extended period of time, GERD can arise. Acid reflux and GERD occur when the valve is weak or not working appropriately. Laparoscopic Nissen fundoplication is used to treat hiatal hernias or GERD. The fundoplication procedure is a process where the stomach gets wrapped around the –valve– to stabilize the stomach pressure so the acid won’t continue going up. 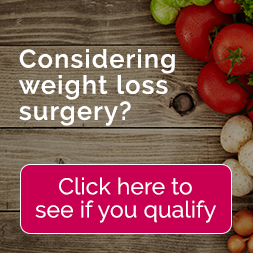 If a patient has had fundoplication surgery before bariatric surgery, the fundoplication has to be cut away and isn’t redone after the weight loss procedure. This is why we recommend getting the Roux-en-Y, or gastric bypass surgery. 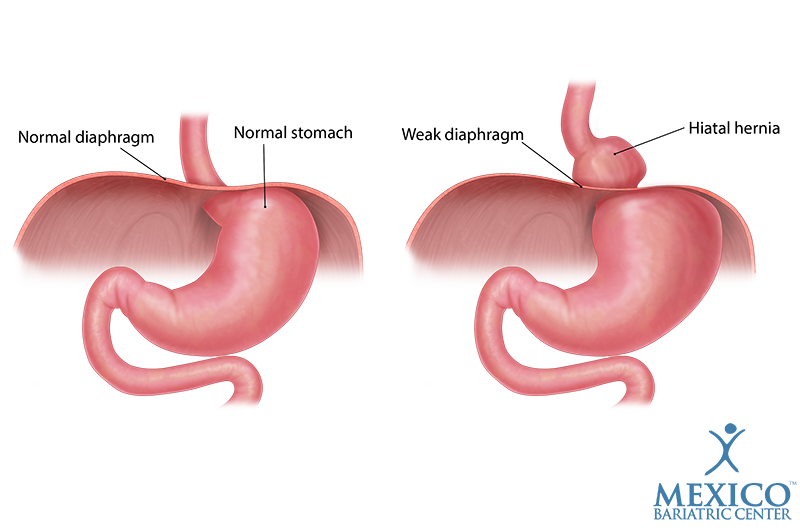 The gastric bypass is the best procedure for fundoplication patients.